I’m sorry I’ve been slacking on posting my recipes for you guys! I’ve been swamped with Organic & Bio Chemistry homework and studying. I have a lot of new recipes to share. I have perfected my veggie ramen, I have a new favorite “classic ranch” salad, AND I have started making homemade sushi! Lots of healthy and exciting posts are on the way!! Tomorrow is officially the first day of Spring! Time for Rosé and cold, raw salads! These are a few of my favorite things! I’m very excited to share this recipe with you guys! This is dairy-free, gluten-free, raw, vegan, and paleo friendly! I’m also making it with chicken + a sprinkle of shredded parmesan for my husband. Both ways are a hit! Spiralize the zucchini. 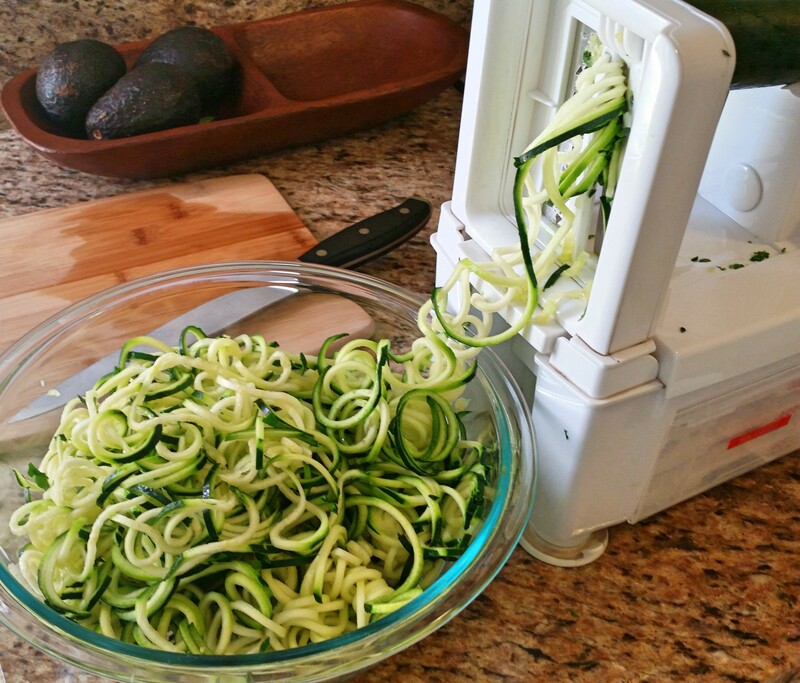 ** I LOVE my Paderno USA 4-blade Spiralizer! Cut cherry tomatoes in half or in quarters. Cut basil into ribbons. I use my kitchen scissors for this. 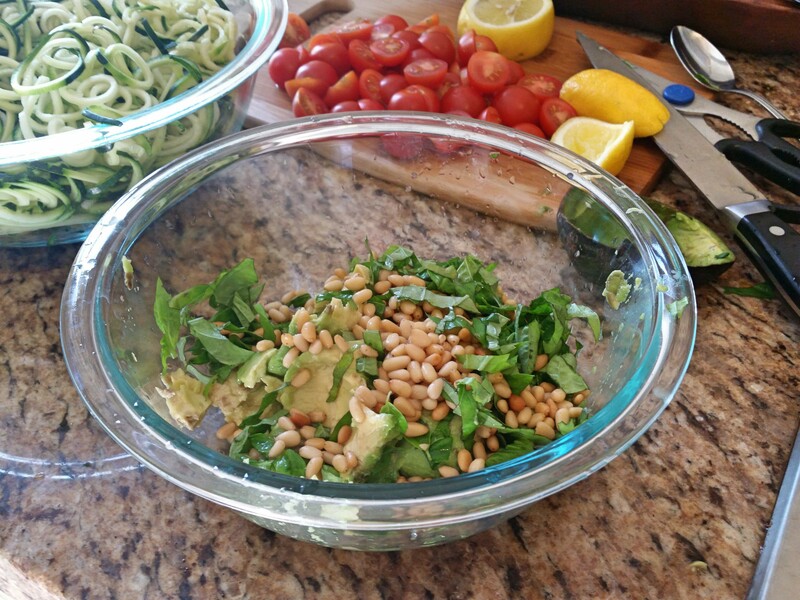 In a mixing bowl, add avocado, basil, pine nuts, and a big squeeze of lemon juice. Mash and mix (like you’re making guacamole!) I used a fork to mash it up. Add more lemon, or more basil until you have your desired flavor. 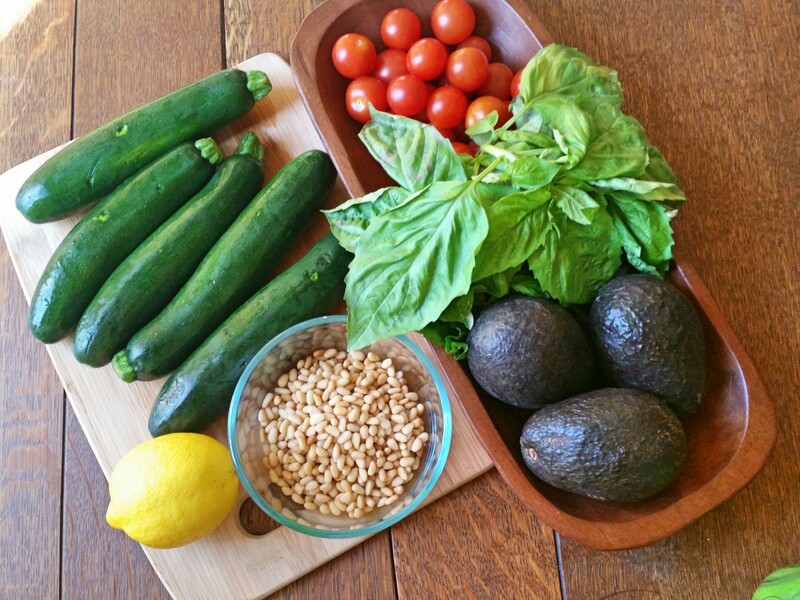 This is my “lazy pesto” when I don’t feel like getting the food processor dirty…. But, if you’re not feeling lazy, you can make the avocado pesto in your food processor! Place avocado, basil, pine nuts, (and garlic) in a food processor and pulse until it turns into a hummus-like consistency. Then add lemon juice to taste. It comes out really lovely and creamy like this. 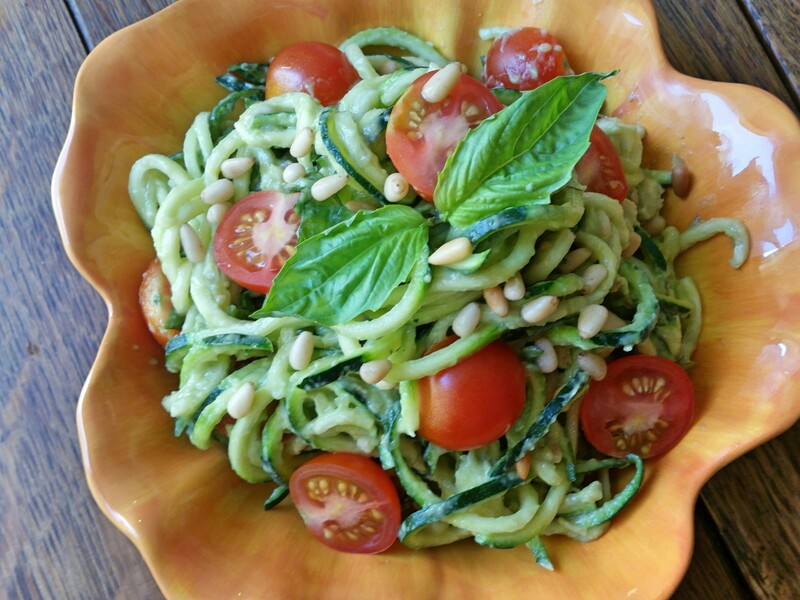 Mix avocado pesto with zucchini noodles. Then add the tomatoes. Salt + Pepper to taste. I am eating some of this now, but I absolutely love it straight out of the refrigerator–nice and chilled (for about 30 mins). Remember, avocado turns brown when exposed to air, so if you are going to prep this in advance and want it to stay pretty & green—make sure you store it in an air tight container in the refrigerator. ** Also, an extra squeeze of lemon helps it keep it’s color longer. And, in my opinion, the lemon really enhances the flavor. Garnish ideas: pine nuts, basil, shredded parmesan, chili flakes. This makes a great side dish for a barbecue. It is a refreshing, creamy, and healthy alternative to mayo drenched “cold salads” that we typically see at BBQ’s. Jonathan’s getting his with chicken + parmesan cheese. I kept mine raw + vegan. 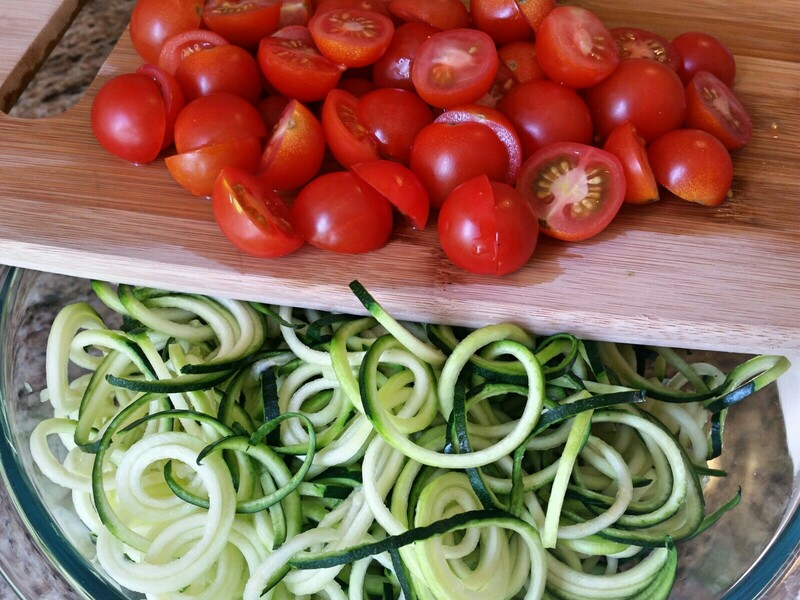 **If you prefer to have cooked zucchini noodles, bring water to a boil and cook zucchini noodles for about 2 minutes. Drain in a colander and let cool. If necessary, you can run them under cold water to stop them from over-cooking. 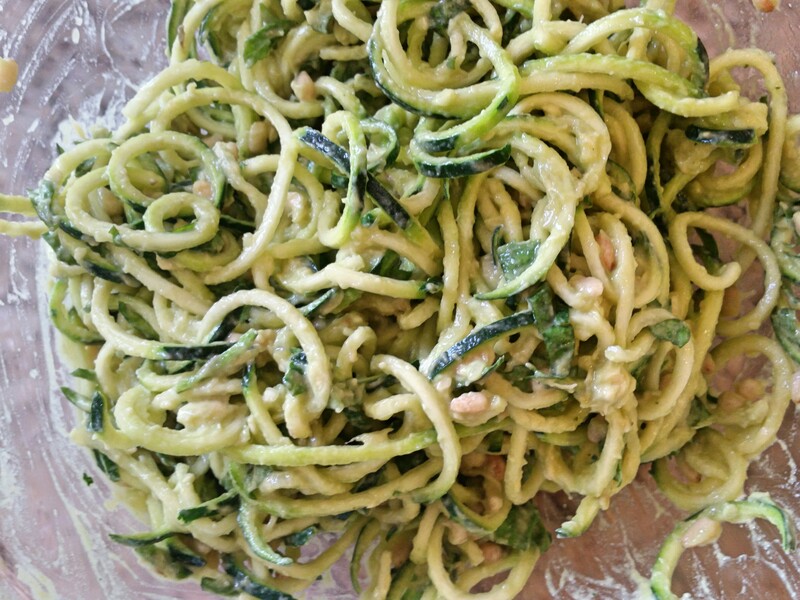 Once zoodles are cool, mix with avocado pesto. (OR) Sauté zoodles in a pan for a few minutes, let them cool, drain any excess water, & mix with pesto. Try not to over cook the noodles because then they’ll turn to mush and it won’t mix well with the pesto. **This is a recipe that you make and serve immediately (OR) Make, store in an air-tight container, chill, and serve within a few hours. I have eaten it on day 2 and it still tastes delicious, but it’s NOT pretty…think about how guac looks after a few hours. 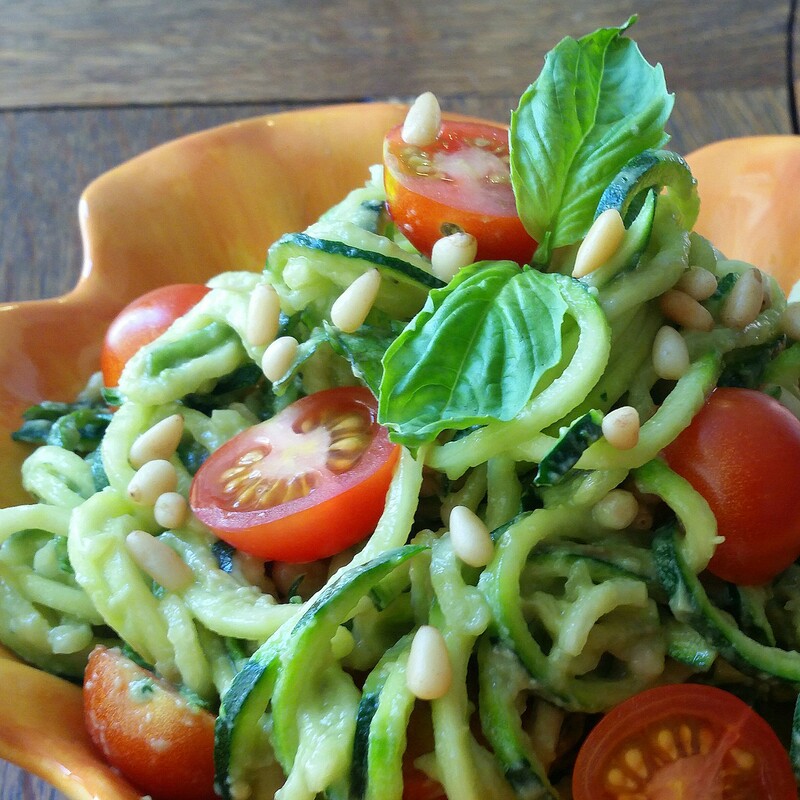 This entry was posted in Meatless Monday, Recipes, Salads, Side Dish, Vegan, Vegetables, Vegetarian, Zoodles, Zucchini. I can hardly wait to make this & eat it! 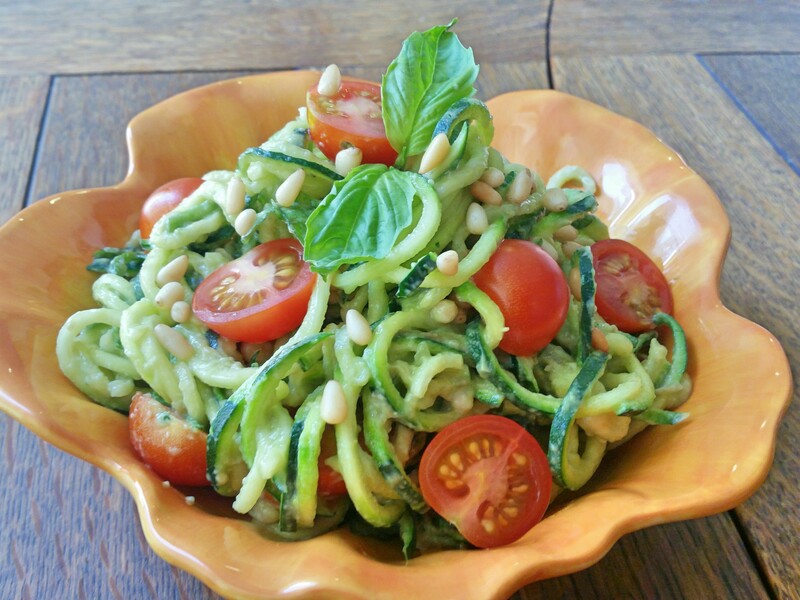 Out of all the “raw” zoodle recipes I’ve made, this might be my favorite!! Made this last night and it was SO GOOD! Thanks for sharing this recipe, Siobain.